Writing in the Parish Magazine at the start of our month long Stewardship Campaign the Vicar calls us to be a generous people. For many of us the word generous conjures up money and our attitude to it, but it is about much more than money. The Oxford English Dictionary definition of generous is “giving or ready to give freely, free from meanness or prejudice”, while the Collins dictionary speaks of being ‘free from pettiness in character and mind, munificent”. So friends as we launch our stewardship campaign I pray that we may blessed with these qualities and learn how to us them to the glory of God. How different the world would be if all people approached a situation asking what was best for the common good, rather than what is best for me. Not “how much tax would I need to pay to fund x,y,z?” , but “ How can I better support those in need?”, be they the sick, the elderly or the refugee. How different the world would be if we did not judge people prejudicially. That is not to say that we should water down our principles, but we need to approach people and situations in love. How different the world would be if we gave with out counting the cost – after the example of our Lord and Saviour. Organised by Cadw, the Welsh Government’s historic environment service, Open Doors offers both local people and visitors alike the chance to explore the hidden treasures of Wales’s culture and history. Although we are open every day here at St Mary’s Priory Church on September 26th you can join the new resident Monastic Community and follow the 1,000 year old tradition of the Monastic Day. On the following day September 27th you can visit our sister church St Peter’s, Llanwenarth Citra.There will be Morning Worship as usual at 10:00 which all visitors are welcome to attend. Following this and until 5:00pm members of the church family will be in attendance to show visitors around the church, to give details of its history, and to explain our current renovation and improvement projects. Hot and cold drinks and refreshments will be available and it is planned to have local produce and cakes available for sale. 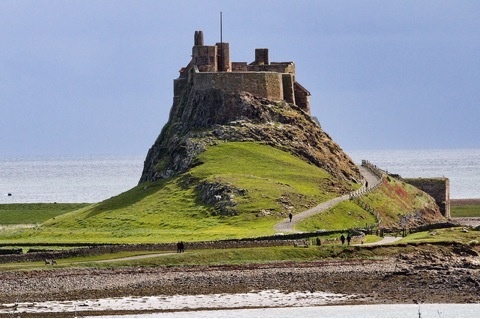 Details of the Parish Pilgrimage to Lindisfarne in September have been released . 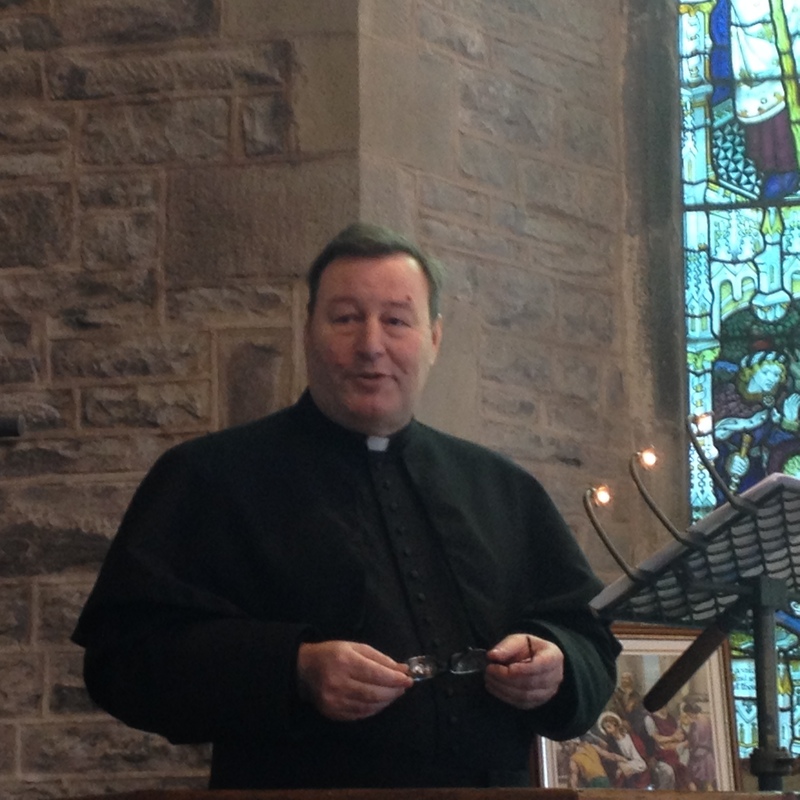 The four day Pilgrimage is led by the Vicar and Fr Malcolm Lane. 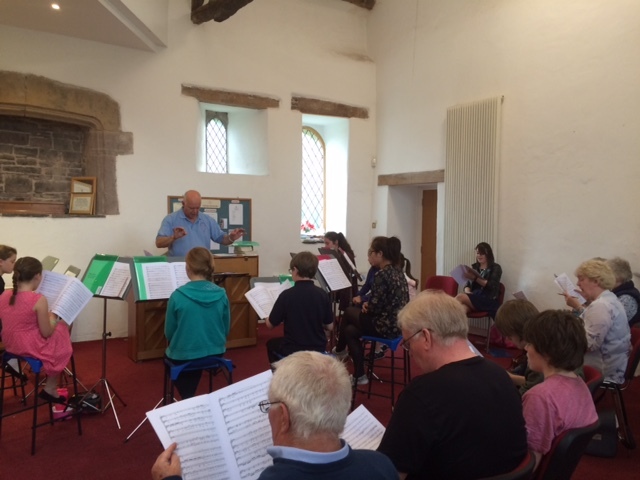 The Choir held its final rehearsal early on Monday morning at the Priory before embarking for Salisbury Cathedral where they will lead Evensong this week. There may be some disruption to the Abbot’s Garden during September & October due to work on lowering the ground level to the east of the Lewis Chapel and work on the Chapel’s East wall being undertaken. 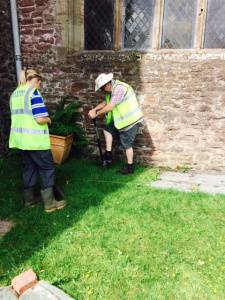 We apologise for any disruption this will cause, but the good news is that this is the start of work to prepare for the installation of the Jesse Memorial Window. Meanwhile in York the window’s designer Helen Whittaker has started work on the window in her studio. Commenting Fr Mark said,”While we will not see the window installed for another 10 months or so, it it good to know that work is under way at last”.